We wrapped up the Negative Space Challenge in my local chapter of the Modern Quilt Guild, the Tampa Modern Quilt Guild, over the weekend, and it was a lot of fun to see the different projects that everyone put together. 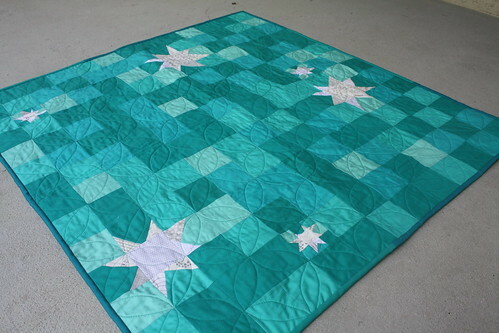 The focus of the challenge was to use negative space as a main design element of your quilt, and that the quilt could be anywhere from the finished top stage to a completely finished quilt. We had five entries in total, but unfortunately, I didn't bring my good camera with me, so I only have my phone camera pictures to share. You can check them out on Instagram, I'm @dontcallmebetsy. Because this quilt was straight up patchwork, I really wanted to do some quilting that would take advantage of the built-in grid from the patchwork seams, so I went with simple orange peel quilting. 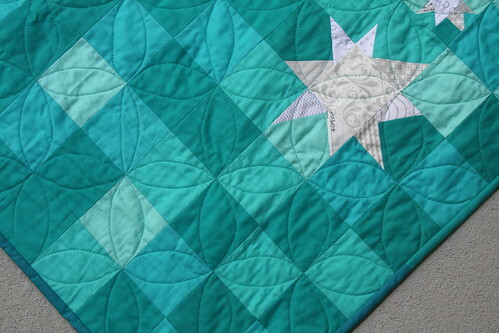 I happened to have a limited supply of teal thread, three different small spools of Aurifil, so there's three different shades of teal quilting throughout the quilt, which I think enhances the pixelated feel of the patchwork. 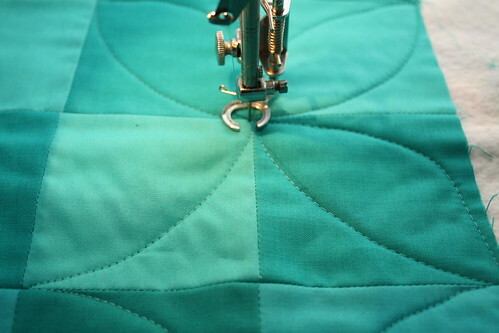 I love quilting those orange peel shapes, they're really quite relaxing and enjoyable! When it came to binding, my fabric was pretty much all packed up, so I had to dig in my scraps to find some strips of teal solids to use. I found two different Kona solid ones and alternated the piecing of them in the binding. I like the final look that the variation in color brings. Monday again already? How is it that the weekend is over already?! 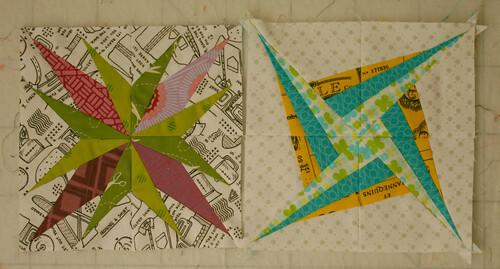 It was a busy weekend, but a good one, and even a quilty one for the most part. I spent Saturday visiting some local quilt shops and attending the Original Sewing & Quilting Expo in sort of nearby Lakeland. It was an interesting trip. Most of the booths were comprised of local quilt shops and machine vendors, with some random vendors, like an exercise booth and a hand lotion booth. I went with Olivia, a friend from the Tampa Modern Quilt Guild, and we had a good time, trying out longarm machines and poking through fabric booths trying to find modern goodies, which were tough to find. I even fell in love with the Juki TL-2200QVP Quilt Virtuoso Pro, a gorgeous longarm machine, but alas, I have no room for such a fun toy. I did luck out and find a yard bundle of one of my favorite lines of all time, MoMo's It's a Hoot. Snapped that right up as soon as I found it! I also picked up a few extra FriXion pens . Have you tried those before? They're a standard office supply pen that you can find at Staples, Office Depot, and the like that is erasable, and disappears when an iron is applied. 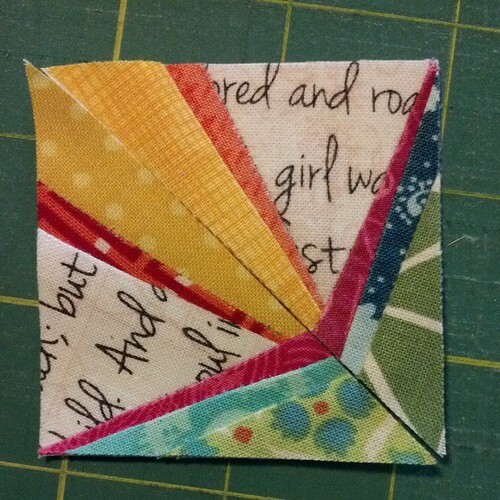 They're great for marking HSTs and such! We saw a few cool product demos, like this bias binding ruler by TQM that makes bias binding take a bit less brain power. The ruler even folded up in the middle, which I thought was pretty cool. There was a other ruler , also by TQM, in the same booth that helped you join the two tails of binding after you've sewn the rest on, and that was awfully tempting. We also managed to get clobbered by chicken feathers. Literally. After the expo, we went to a few local quilt shops, and on our way to one of them, we wound up behind a chicken truck. At first, we had no idea what was on the truck, only that little white pieces were flying off the truck at us. Then at a stoplight, we were able to get close enough to see the poor little chickens all caged up on the truck. It was definitely a hilarious sight to see. The Tampa Modern Quilt Guild held its February meeting and sew day over the weekend at Inspire Quilting & Sewing. Thanks for allowing us to use your fantastic classroom space, Inspire! Between shopping and sewing and sharing projects, we had a fantastic time. I couldn't help picking up a few low volume stash builders, like this fabulous black and white How to Iron a Shirt print from Timeless Treasures. I brought a few different projects to work on, not sure of what I'd be in the mood for, and I wound up working on some blocks to make a cover for my Juki, with Olivia, who's working on a cover for her Viking. 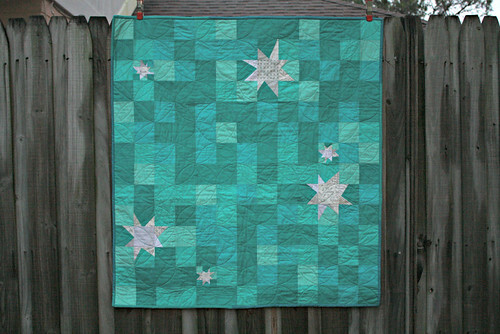 I'm using a few 6" Lucky Stars BOM blocks (the February, practice, and March blocks), and managed to get through two of the three blocks at the meeting. Olivia's blocks are going to be gorgeous, too. 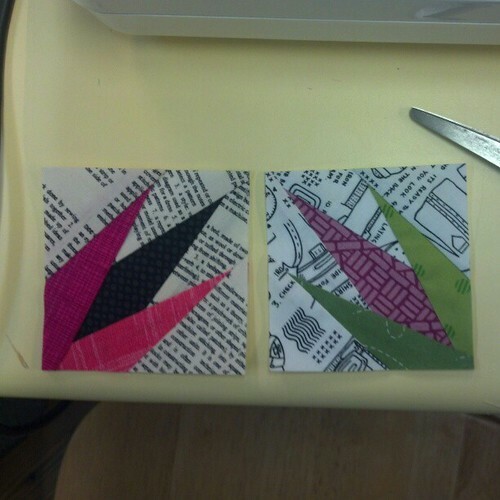 I had a lot of fun helping her get started with paper piecing, and she got the hang of it really quickly. I can't wait to see how all of her blocks turn out, I just love the whole pink and black color scheme!